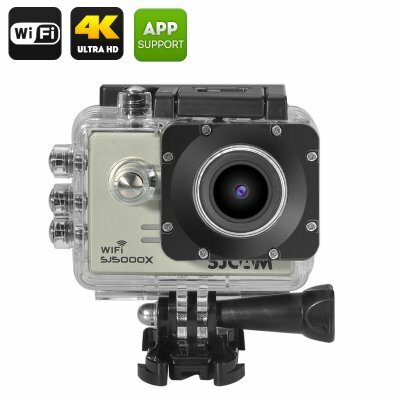 Successfully Added SJCAM SJ5000X Elite Edition Action Camera - 4K, Gyro Sensor, WDR, 170 Degree Lens, Wi-Fi, Loop Recording (Silver) to your Shopping Cart. SJCAM SJ5000X Elite has some outstanding features that bring you superb video capture at 4K resolutions at 24fps. It uses a Sony IMX078 12MP CMOS sensor that has high sensitivity and works well in low light. With a built in Gyro stabilization sensor the SJCAM 5000x Elite brings smoother results and its 170 degree lens will let you fit in all the action and is superb when used for extreme sports. If you require faster frame rates, then the interpolated 4K resolution can be changed to 2K at 30fps or FHD 1080p, which the action camera records at 60fps, great for filming fast paced sports. The action cam uses H.264 video compression and with a micro SD card you can enjoy up to 32GB of storage. The SJCAM SJ5000X Elite has a compact stylish design and comes with a waterproof case. Meeting the IP68 standards this waterproof case provides protection to depths of 30 meters underwater so documenting your scuba dives or water sports won’t be a problem. With loop recording features the SJ5000X Elite can double as a car DVR and so should you have any traffic accidents you will have plenty of HD evidence to back up your case. All the footage can be played back on the 2.0 inch LCD screen or with its Wi-Fi connectivity you can use the iOS or Android app and transfer photos and video direct to your phone without the need for any cables. A removable 900 mAh battery brings around 80 minutes of usage time when recoding at 1080p 60FPS or 2K 30fps. This original SJCAM SJ5000X Elite has the SJCAM QR code and unique id number that can be use to confirm it is an original SJ5000X Elite Sports action camera.